I just wanted to share this beautiful maple chair the husband built for me. 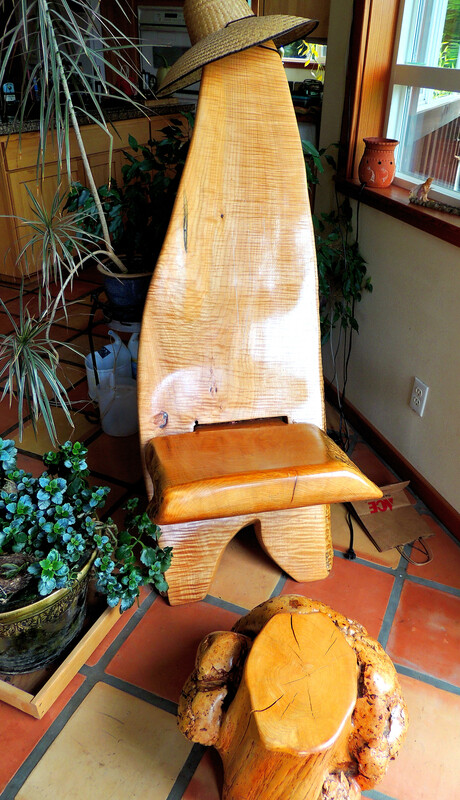 We had seen a chair in Mexico that was similar, but not near as cool, and he took a picture of it in his mind and then, a few years later, he made this for me. With the footstool, too. He put it in a sunny spot for me and surrounded it with plants and calls it my ‘time out chair’. I get to decide when I need a time out and can sit in it and no child is supposed to bother me. Sometimes it works, sometimes it doesn’t. But isn’t he sweet to think of me and spend the time to make it and set it up. I LOVE, LOVE, LOVE it! A chair for the good life! Who knew there was such a thing? This entry was posted in Simple Living and tagged simple living. Bookmark the permalink.